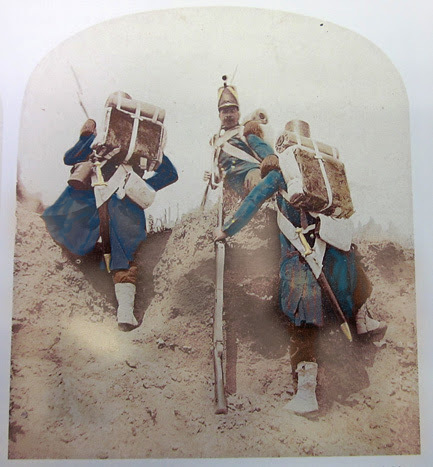 The 1st Expeditionary Brigade of the Imperial Guard landed in the Crimea between January and April 1855; the final elements sailed from Marseilles on 23rd March, landing at Kamiesch 19th May, via the Camp de Maslak, near Constantinople. The Russians had constructed two redoubts and rifle pits on the French left, controlling the approaches to the Bastion du Mat (Flagstaff Bastion) and Bastion Central (Central Bastion), causing the French approaches to Sebastopol to stall. As one anonymous Officer of the Voltigeurs wrote: The dominant position of the place d’armes would soon [be] completely neutralised, and we would be able to put [in] good order, all our work leading to siege on the left. It was necessary to remove it at any price. The attack was planned by General LaMotterouge. Under his command were Generals Bazine and Rivet. It was a clear, cold, night and the troops began to move up to the advance trenches under strict silence at 1am; General Canrobert had ordered the French not to fire unless absolutely necessary and for the attack to be made at the bayonet point so as to take the Russians utterly by surprise. The attack was timed for 2am and all three columns moved off simultaneously, the troops under La Motte Rouge being the first to engage the enemy (the Russian centre). 46th Line leading, commanded by Colonel Gault, they over threw the Russian outposts and crossed the first parallel, but came under a determined counter-attack from the second parallel. The left hand column under Bazaine attacked the Russian right by the Cemetery whilst the left hand column (General Rivet), throwing out the Chasseurs a Pied as skirmishers, outflanked the Russian redoubt, taking the Russian position in the rear. At about 3pm on the 2nd the Russians launched a counter-attack, initially taking the French by surprise. Captain Guillaume-Étienne Michel Genty (1st Voltigeurs), supported by one company from the 10th Battalion Chasseurs a Pied, and two from the 80th Line, led forward two companies of the 1st Voltigeurs. Voltigeurs leading, the French driving back the Russians in disorder. Captain Genty was twice wounded in the head but refused to give up command. Two other officers were wounded, one, Sous-Lieutenant Montcet was taken prisoner. Genty was made an Officer of the Legion d’Honneur and Lieutenant Cambot, Sous-Lieuenant Montcet, Sergeants Odeyer and Frioux, Corporal Dechaisse and Voltigeurs Solimet, Legay and Pisse all received the Legion d’Honneur for their part in the action. The Guard had proved that they were not just popinjays. By 6am it was all over and French engineers under Colonel Guerin began to connect the captured positions to the French trenches. The work went on during the 2nd May and two companies from the 1st Foreign Legion Regiment, one company of the 43rd Line and two battalions of the 98th Line occupied the new trenches.